"Third runway an ‘environmental success story’"
"Giant walls hold back a lot of dirt"
How much soil does it take to build a mile-long runway embankment? Enough to fill the Empire State Building 12 times. 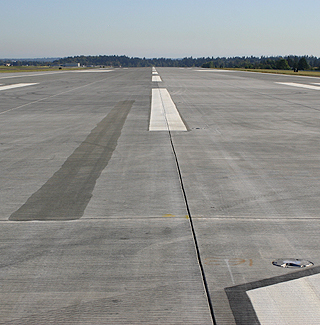 "Clean water a priority for runway project"
Fly ash, a byproduct of burning coal, was substituted for nearly one-third of the cement in Sea-Tac’s new runway, shown on the left. Fly ash allows cement to be produced using less energy. 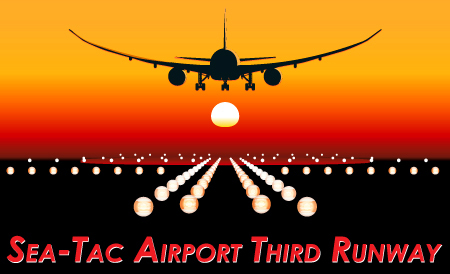 The new runway will allow Sea-Tac to land about the same number of aircraft in poor weather as in fair weather. • To build the runway, the port purchased about 500 properties including 400 single-family homes and relocated the owners. • There were seven construction stormwater ponds and four treatment centers during construction. • To mitigate the impacts of filling 20 acres of wetlands, the port is creating or enhancing 178 acres near the airport or in Auburn, along the Green River. • The third runway is not designed to increase capacity, but it will allow landings on two runways at the same time in all but the worst weather. The ports says the new runway will reduce delays and costs for passengers and airlines. 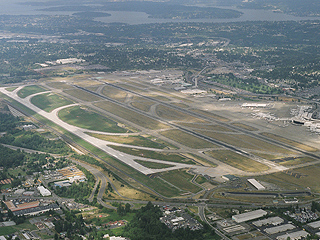 • Reconstruction of Sea-Tac’s 11,900-foot-long easternmost runway. Work to begin in the spring and finish by the fall of 2009. Budget: $85 million. • Five-story consolidated rental-car facility at International Boulevard and Highway 518. Currently under way, and set to open in 2011. Estimated cost: $382 million. • Sound Transit Central Link light-rail station. Port will build a walkway from the station to the terminal. Set to open in December of 2009. Estimated cost: $3 million to $6 million. • Preconditioned-air system for aircraft waiting at gates. Port will build a fan system designed to cut airline costs and emissions. Budget: $31 million.